What makes up your food dollar? Have you ever wondered what makes up the amount of money you spend on food? The United States Department of Agriculture recently released its annual breakdown of the country’s food dollar giving consumers an answer to this question. We’ve visited this topic in the past, but the minuscule amount of money (10.5%) that goes back to the farm (where your food was grown) is simply amazing. Our farmers and ranchers continue to produce year after year meeting demands in a way that is efficient, profitable, environmentally conscious and yet highly affordable for consumers. And thanks to that efficiency, we spend a lower percentage of our income on food than any other nation in the world! 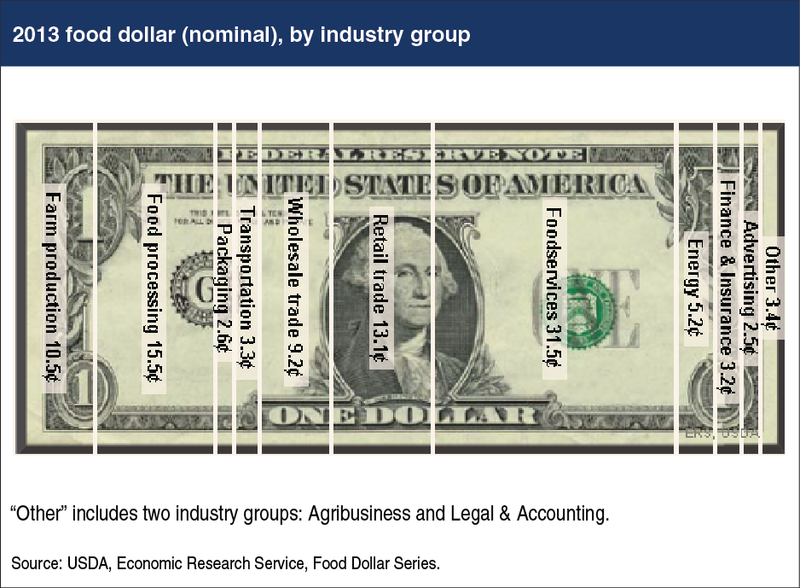 Farm commodities make up only 10.5% of food costs, so don’t be quick to blame the price of corn, soybeans or beef without considering the many other components that make up your food dollar like energy, transportation and packaging. Secondly, remember that our food is very affordable compared to any other country in the world. Americans are extremely fortunate with an abundance of safe and healthy food options. This entry was posted in News and tagged ag, farm, food dollar, South Dakota, USDA.